Cascade of Leaves Earrings symbolize superimposed leaves with oval Green “opals”; these gemstones look like seeds sliding on the leaves in descending movement towards the Earth. Green “opal” is a gemstone of Earth that brings stability and practical sense by promoting the continuation of initiatives until they produce a concrete result. 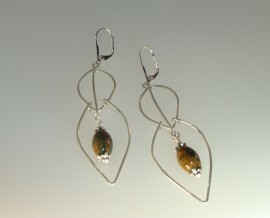 Green “opal” is in fact a type of chalcedony with green and brown hues. Cascade of Leaves earrings combines green "opals", 1/10 silver-filled and silver-plated; approximate length is 5.5 cms (2.16 inches).